I occasionally get calls from my neighbors about a swarm that settled in their tree, and every now and then, someone has a hive that established itself in one of their outbuildings. I had a cutout job a few days ago. 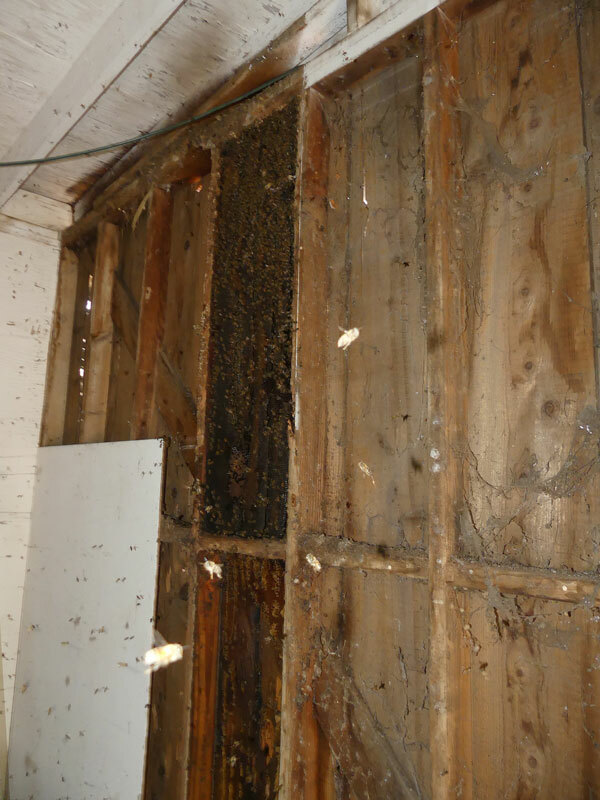 The couple had an old outbuilding and bees had set up a hive in the wall, between two studs. Just as aside, one common place to find hives is in those cable TV boxes that are in the ground. The cover has a small hole that the cable TV workers use to lift the cover and the bees find that hole to be a perfect hive entrance. I don't know what the cable TV company does if they have to go into one of those boxes for service, but I wouldn't be surprised if they exterminate the bees. I've removed a few of those hives that had quite a bit of comb, so they must have been there for at least a couple of years. But back to this cutout job. 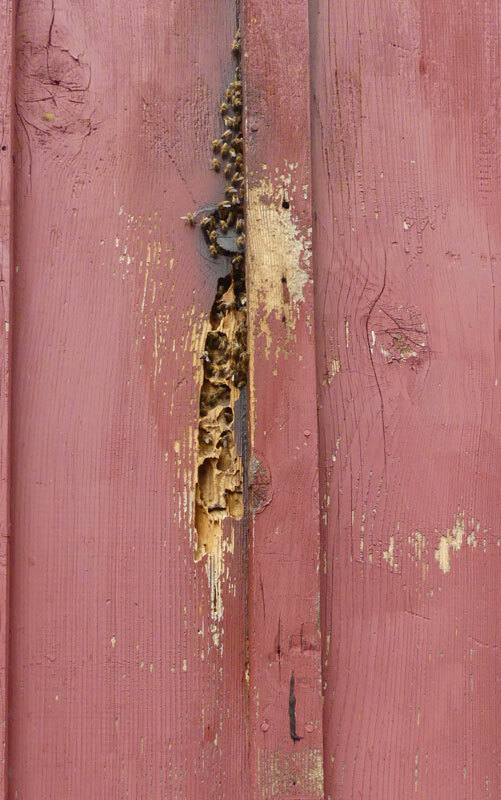 Once I got the full story, it turned out that the bees had been there for about 10 years. The wife just didn't want to harm the bees so they left them in the wall. But the bees were not all that docile and would attack the husband while he was cutting grass. 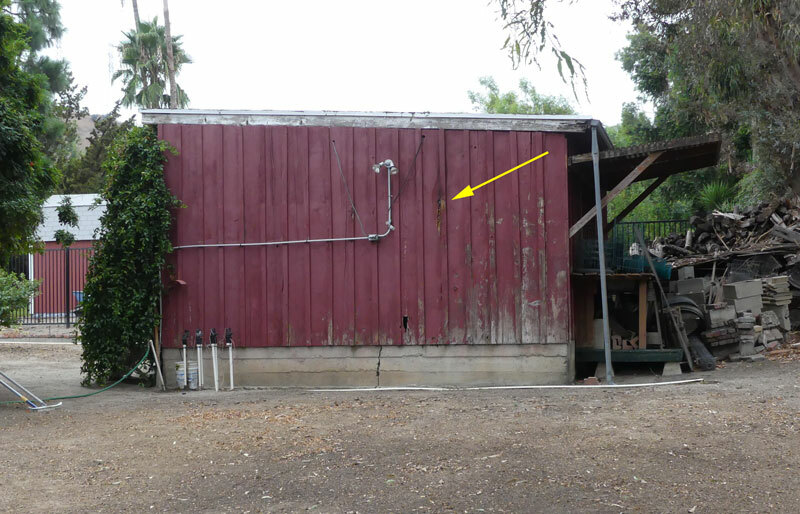 Here's the outbuilding with an arrow pointing to the hive entrance. A close-up of the entrance. The bees were pretty docile at this point. 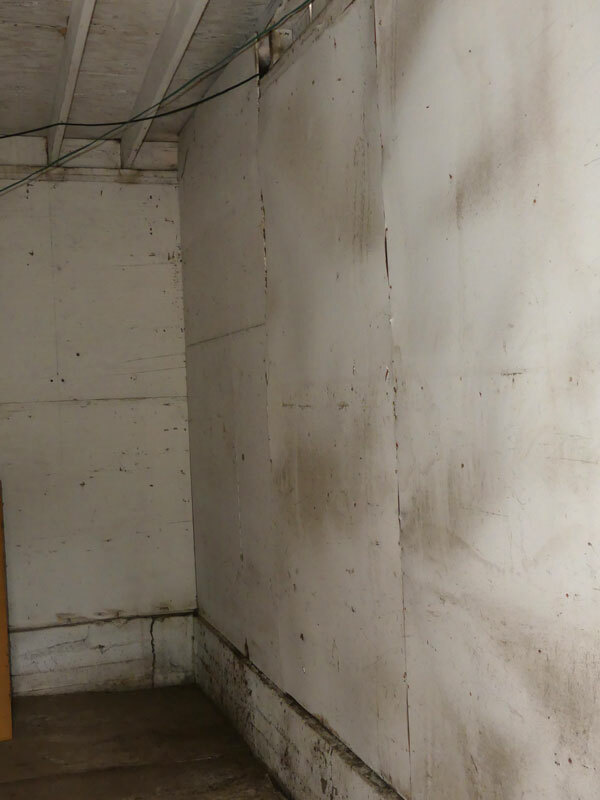 Here's the inside of the outbuilding. We're going to have to remove some of the paneling to get to the hive. Here's the hive with the paneling removed. By the time I took this picture, we had already removed some of the comb that was in the lower part of the hive. That comb was fairly light indicating that it had been made recently. 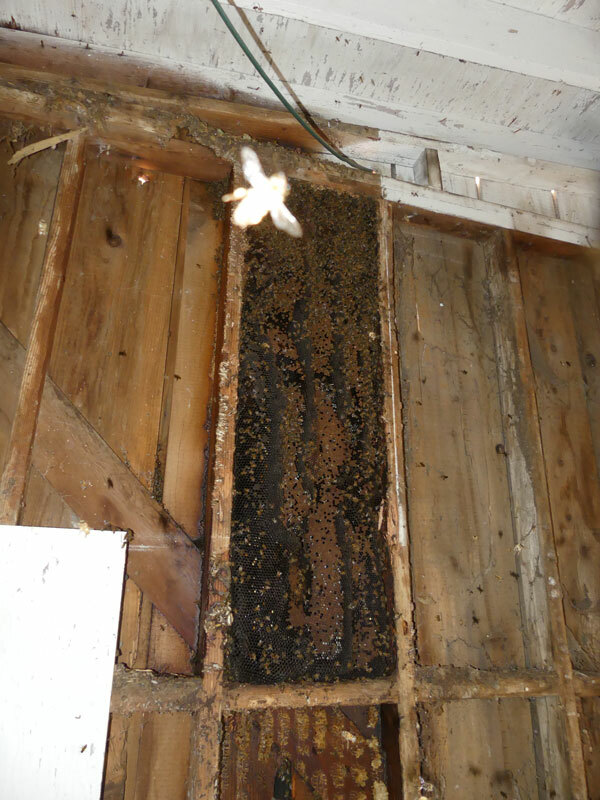 The comb in the upper part of the hive is very dark, indicating that it is old comb. And here's a better view of the upper part of the hive. A bee flew right in front of the lens when I took this picture. A picture of my friend, JT, who was helping me with the cutout. You can see the bee vacuum in the lower right part of the picture, and the light comb in the container. During the removal, I did not find the bees to be excessively defensive, considering that we were tearing their hive apart. We put quite a bit of their brood comb on frames and put the frames into a large brood box. Then we took the hive with the frames, and the bee vacuum, to the home of an urban beekeeper who wanted another hive. 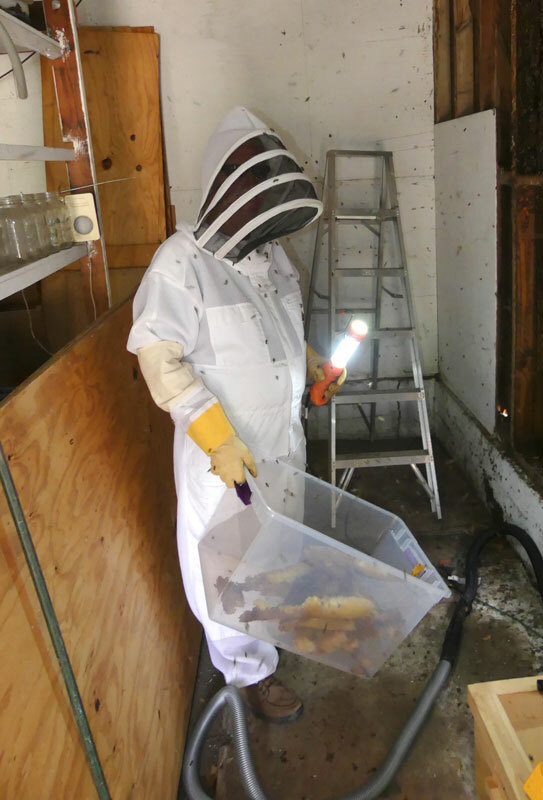 But when we released the bees from the bee vacuum into the hive, it became obvious that these were Africanized bees and excessively defensive. I walked several hundred yards away from the hive and still had a LOT of bees around me. The bees also began terrorizing the neighbors. It was obvious to me that this was not going to work out and that the bees were too defensive. I had to exterminate the hive. There was really nothing else I could do. I had no alternate place to take the bees and the bees could not be left where they were. Sad day, lots of work to get the bees and then to find out they were too Africanized to keep.